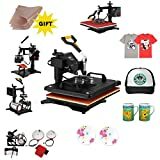 Do I recommend this Dabpress rosin press plate kit? Absolutely. Eventually, it’s time for everyone to upgrade, and this is definitely an upgrade. The plates are incredibly effective, and the temperature control box, incredibly accurate. The wide temperature range allows you to play around and experiment with different temperatures and different amounts of kief, flower, or whatever you choose to press. This means you can figure out exactly what works for you and get consistent results each time. I would recommend this product to anybody that is looking to increase their yields without wasting tons of time on assembly. 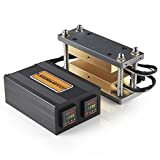 It’s important to remember that this is not an actual rosin press, it is just the plates and temperature control for you to attach to a shop press. Still, this caged plate kit can take your concentrate game to a whole new level. 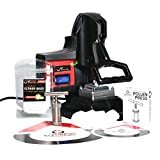 Regardless of your skill level, if you’re looking to create the ultimate rosin press to use at home, you’ll need these plates. Plus, what’s the harm in giving them a try? 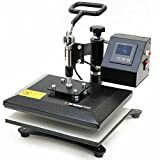 Whether you are brand new to rosin pressing, or experienced and just tired of low quality presses with low yields, we’re all here in search of a rosin press that’s worth the money. However, sometimes the best thing to do is to build your own rosin press. 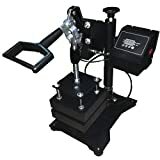 Building your own rosin press may take a little more time than buying one, but it gives you total control over what kind of rosin press you have. To build a rosin press for home use, one of the few things you’ll need are the plates. There are tons of options on the market, but today we’re taking a look at the Dabpress dp-rp37 Rosin Caged Plates. How do they measure up to other plates? Keep reading to find out. I have had a shop press for quite a while and have gotten lots of use out of it. However, I found myself wanting bigger yields and decided to experiment around a little bit. I ordered these plates because I was impressed with how sleek they look and by the power they claimed to have. I was not disappointed either. When I got my kit, I immediately put the plates on my press, which was super easy to do since they came pre-assembled. There was really very little that I had to do, which is a huge plus to me. The only kind of assembly I had to do was installing it on my press, and the plates even came with everything I needed to do that, which was just a screwdriver, the whole thing took only a few minutes. I read through the instruction manual, and after installing the plates, decided to give it a go. Setting the temperature was easy, the temperature control box is pretty intuitive and can be figured out very easily. Right away, I liked these caged plates, and could tell a noticeable difference in my concentrates. The concentrates I made with this kit tasted cleaner and I could even tell a difference in the size of my yields. Extracting oils and making concentrates can be such a rewarding hobby. Not only does it give you a sense of pride and accomplishment, but it can also save you money, since making your own concentrates often cost much less than buying them. 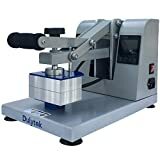 I prefer making my concentrates over buying them anyway, because I know exactly what is going in the concentrates and exactly how they were made, I enjoy the control I have when it comes to making concentrates. As far as how it operates, I couldn’t find anything I didn’t like. These plates are perfect for people who do not press very large quantities at once, although it can handle more than you’d expect. I only press a few grams at a time, which is what I recommend you start with, too. What makes these plates so great is that they aren’t cheap or made out of subpar materials. The bracket is made from stainless steel and the plates are 6061 anodized aluminum plates. This is beneficial because it means it will be able to withstand the intense pressure it is put under, without breaking or wearing down. The anodized, food grade plates also ensure that your extracts are made on a clean surface for the best taste. The heating rod and sensor rod in this kit are separated to ensure both of their accuracy. Having the rods separate allow them to each perform their separate jobs, monitoring the temperature and maintaining it at whatever temperature you set it. This is great because you want to know that the plates are the correct temperature, and not too hot or too cold. If they get too hot, it can scorch your herb or drastically reduce your yield. On the other hand, if the plates are not hot enough, they won’t be as effective and may take much longer than it should. If you already have a H-frame shop press, you can buy these plates knowing they will fit right in place. If you do not have a press yet, if you decide to go with these plates, make sure whichever one you get is an H-frame. These plates are compatible with any H-frame press with 12 to 20 tons of pressure, which is sure to get you high yields when making concentrates.